and tosses them out to safer shores. like someone else’s pocket comb. Vembedu village is a few kilometers away Ponneri – a small town in the Thiruvallur district. Found near its outskirts is one of my favourite birding spots. One has to cross Ponneri town to reach the Annamalaicheri backwaters or take a boat ride across Pulicat Lake – the second largest lagoon in India. Both are popular spots among local birders. Many water birds migrate to these locations from all over the world. During winter, flamingos can be commonly found. Stern-faced photographers in camouflage vests and expensive cameras too. At the beginning of Pulicat road, there is an unassuming left turn that leads to the Vembedu village. The road is tiny, pot-holed and gorgeously flanked by paddy fields. This village is a haunting ground for a variety of migratory and residential birds. An early morning visit can spell magic. I have spotted many firsts in its nooks and corners; Asian Paradise Flycatchers, Marsh Harriers, Jacobin Cuckoos and Chestnut Munias – to name a few. I haven’t spotted any other birder in this village so far, which makes it a special place for me. While the Asian Paradise Flycatcher made for a fun story given how it turned out, it wasn’t my fondest experience in Vembedu. The time I spent with the Baya Weavers last April has that honor. It wasn’t the first or last time I had seen them. Certainly the most memorable. Even if you have never seen Baya Weavers, you might recall their elaborately-woven nests that look like gravity-defying funnels. It is one of these things that even non-birders are knowledgeable about given how iconic the imagery is. They are sexually dimorphic darlings with the male sporting a yellow suit and a fluffy crest for a scooter helmet. The female looks like a well-dressed house sparrow on a rainy day or a starving brown shrike. Last summer, on a windy day, I had the privilege of spending some time with a family of these gorgeous weaverbirds. Initially the flock seemed aghast at my presence. They flew away to another tree immediately after I stopped the car. They realized soon that I wasn’t going anywhere. And so they returned, one by one, back to their hanging nests amid loud chatter and kamikaze acrobatics. They surveyed my actions every now and then, as if to make sure that I wasn’t after their penthouses. Eventually they lost interest in me and continued to mind their own pretty businesses. It was the first time that I had felt a karmic connection with birds. A growing belief that birds can sense the friendly birder in me. The sort I can’t seem to foster in people anymore. Since then I have had many such experiences with birds. No matter the outcome, I have always felt that they treated me right. The Baya Weavers were the first. I hug them just a little tighter in my head for that. very cool image of her weaving those straw hats and tossing them in the air… i wish she would find dreams to dream as well.. The poem is lovely and so is baya! (tips straw hat) merci K! Love the image of ‘her curled up, dreamless, like someone else’s pocket comb’. 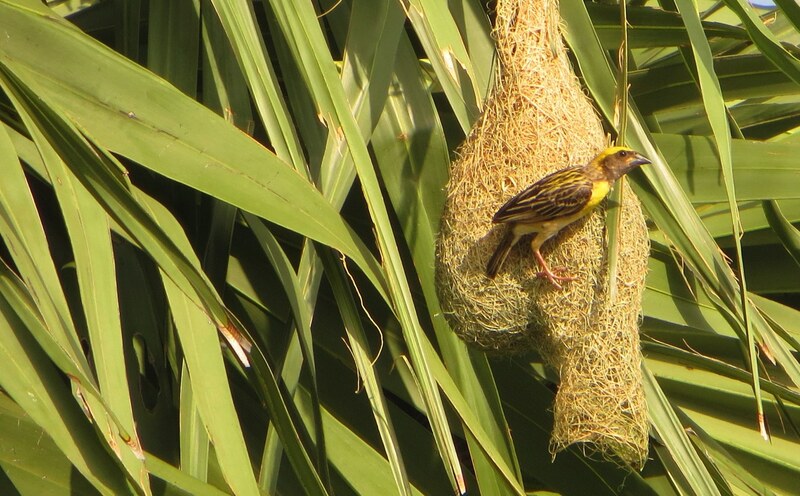 I’ve not had the good fortune of seeing a Baya Weaver specifically myself but their nests have always fascinated me. Oh you will, I’m sure. Singapore is home to the Asian golden weaver me thinks. Please bring us some of that beauty! What beautiful fellas. We are hoping to get down to the lower valley in Texas this summer to see more weaver-types. I’m not sure we have anything like your Baya Weaver though. Nice that they are treating you like just another innocuous birder. You are IN! Yes yes yes (pro wrestling reference, don’t bother)! It means so much that you think I am in! Weaverbirds are so industrial aren’t they. I d imagine there is a worker’s union for them that just makes good sense. It would appear to be for sure (for both the union and that you are ‘IN’)! I’ll be next year is an even brighter birding year for you.